There is nothing much happening over Brexit but the UK Inflation Rate may not be able to support GBP. USD is showing signs of weakness. 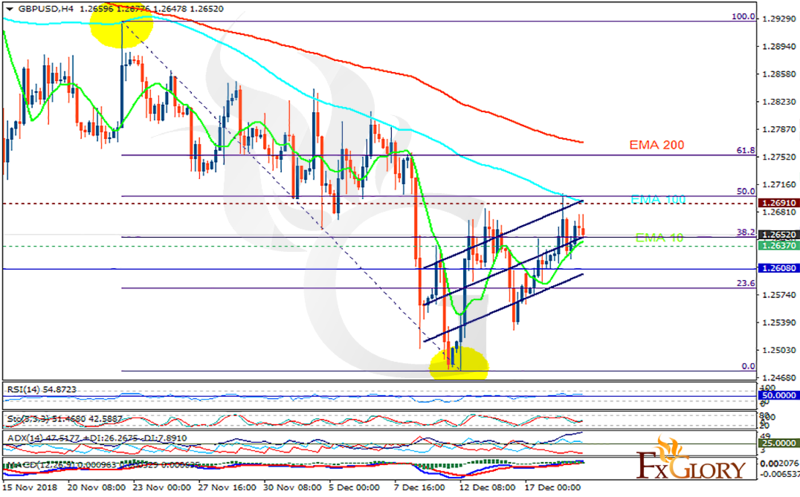 The support rests at 1.26370 with resistance at 1.26910 which both lines are above the weekly pivot point at 1.26080. The EMA of 10 is moving with bullish bias in the ascendant channel and it is below the EMA of 100 and the EMA of 200. The RSI is moving above the 50 level, the Stochastic is moving in middle ranges and the MACD line is above the signal line in the positive territory. The ADX is showing buy signal. GBPUSD may grow towards 61.8 level of Fibonacci at 1.275.